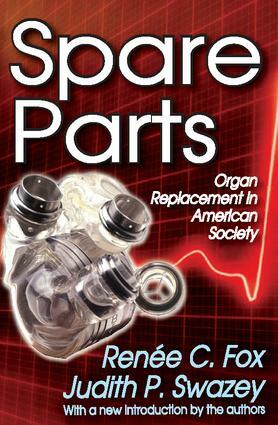 Spare Parts examines major developments in the field of organ replacement that occurred in the United States over the course of the 1980s and the beginning of the 1990s. It focuses upon significant medical and social changes in the transplantation of human organs and on the development and clinical testing of the Jarvik-7 artificial heart, with special emphasis on how these biomedical events were related to the political, economic, and social climate of American society. Part I examines the important biomedical advances and events in organ transplantation and their social and cultural concomitants. InPart II, the focus shifts to the story of the rise and fall of the Jarvik-7 artificial heart in the United States, its relation to American social institutions and cultural patterns, and its bearing on social control issues associated with therapeutic innovation and the patient-oriented clinical research it entails. Part III is a personal conclusion, which explains why the authors left the field of organ transplantation after so many years. Spare Parts is written in a narrative, ethnographic style, with thickly descriptive, verbatim, and atmospheric detail. The primary data it is based upon includes qualitative materials, collected via participant observation, interviews in a variety of medical milieu, and content analysis of medical journals, newspapers, and magazine articles, and a number of television transcripts. The new introduction provides an overview of some of the recent developments in transplantation and also underscores how tenacious many of the patterns associated with organ replacement have been. Spare Parts should be read by all medical professionals, sociologists, and historians.